Home → Invest in Xero Shoes. Invest in the Future of Footwear. Invest in Xero Shoes. Invest in the Future of Footwear. If your investment is in process but not yet complete, you can check on the status by contacting us at investor@xeroshoes.com. You’re invited to become an owner of Xero Shoes, a lifestyle footwear brand with foot-crafted shoes and sandals that let your feet do what’s natural — bend, flex, move, and Feel The World®. Xero Shoes, a woman-owned Colorado company, has generated over $7 million in sales since incorporating1, with revenue growth of 85.3% from 2014-2015 and 91.9% from 2015-2016. Xero is now expanding its product line, as well as its online reach and wholesale channels, and is accepting investors to help fuel that growth. Get more details below, and click the INVEST button when you’re ready to join our worldwide community that Lives Life Feet First. What makes Xero Shoes special? It’s simple: We believe in feet. Your feet are supposed to bend, move, flex, and feel. 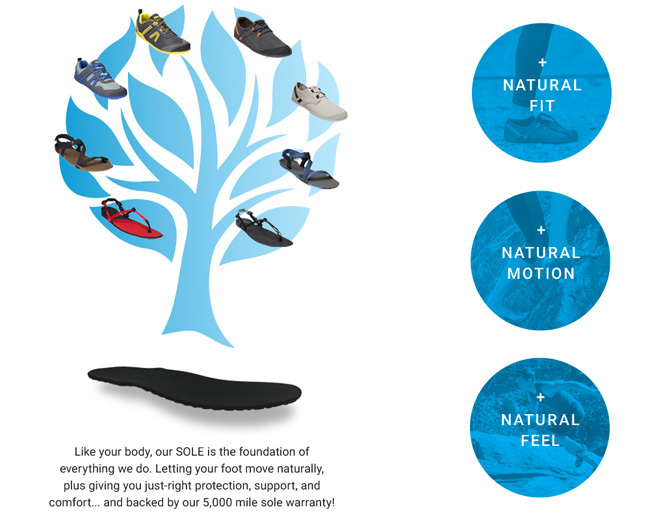 Xero Shoes’ foot-first designs let your feet do what’s natural. Natural Fit — Wide toe boxes let your toes spread and relax. A non-elevated “zero-drop” heel for proper posture. Natural Motion — XEROs are so flexible you can roll them up and put ’em in your pack or pocket (great for travel), and light enough that you may forget you have them on. Your feet can move and flex naturally. And they’re low to the ground for balance and agility. Natural Feel — Our patented FeelTrue® soles give you four levels of protection, while still providing your feet and brain with the stimulation they need. As much as XERO Shoes are about movement, they’re also part of a movement, one shared by our customers and investors: an alternative to the idea that you need a new pair of $175 shoes with some new, “magic technology” every three months. Instead, you can recapture that free, powerful, honest feeling of letting your body walk and run and jump and play the way you did as a child. Remember how much fun it was when you were a kid, feeling the summer grass as you ran effortlessly across the yard? We want you to have that feeling all the time, at any age. 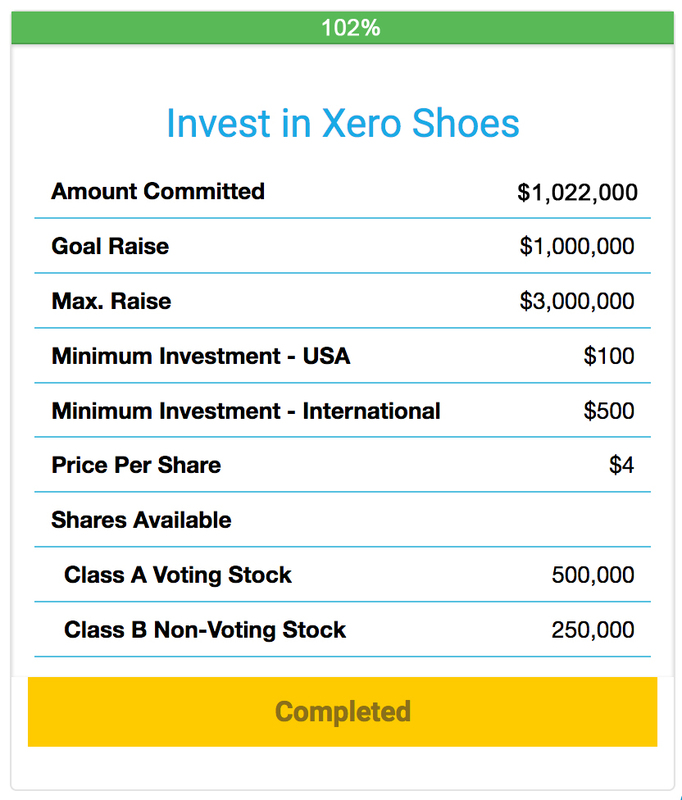 Your investment in Xero Shoes is the first step to help make this a reality. 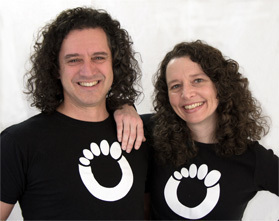 For our first four years, we sold DIY sandal-making kits based on a 5,000-year-old design. The kits give you a sandal that perfectly fits your unique foot shape, and can be tied and decorated to express your personality. When Dennis Driscoll joined the team as Chief Product Developer in late 2012, he combined his 35 years of footwear design experience with the requests and feedback from our customers. This led to a complete footwear line, including ready-to-wear thong style sandals, sport sandals, casual and performance shoes, and boots. In addition, Dennis is working on more than a dozen new designs for 2018 and beyond. When we launched in November 2009, we called our products Invisible Shoes. In 2010, we incorporated as Feel The World, Inc. (FTWI), and in 2012 rebranded our products and established a d.b.a. as Xero Shoes. While Xero started as a “barefoot running” company, and a hobby at that, it quickly became a mission for Steven, Lena, and everyone working at Xero Shoes. Steven has become a leading authority on natural running form, as well as understanding how to design footwear that supports natural movement rather than interfering with it in the ways that most modern shoes do. 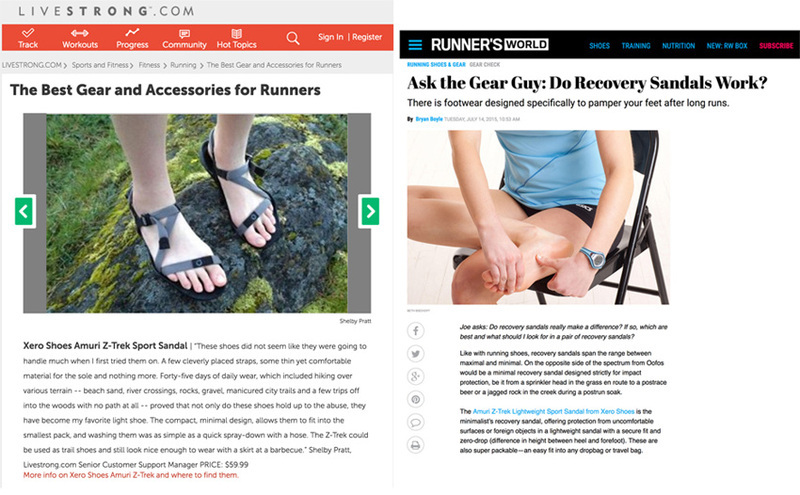 His videos and articles — both instructional and comedic — about natural running and walking, “barefoot” shoes vs. typical running shoes, have over 2 million views. 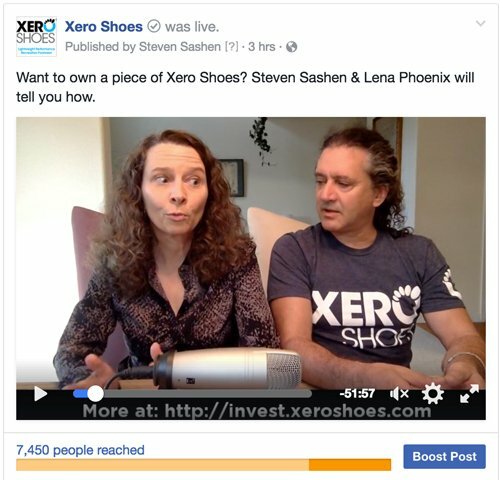 Diving deeper into understanding natural movement, and hearing from thousands of customers who’ve had their own life-changing experiences wearing now-renamed Xero Shoes, Steven and Lena have a fire lit under them. But, of course, knowing that most people buy shoes simply because of the way they look, Xero Shoes is committed to recognizable, eye-catching designs that people notice. As a “lifestyle brand,” our commitment is to developing a complete line of natural movement footwear for any activity, letting you go anywhere, and do anything in Xero Shoes. 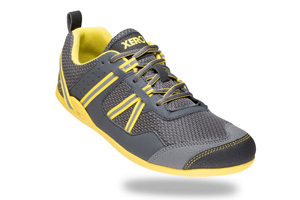 Xero Shoes let your feet be feet. Take the next step with us. 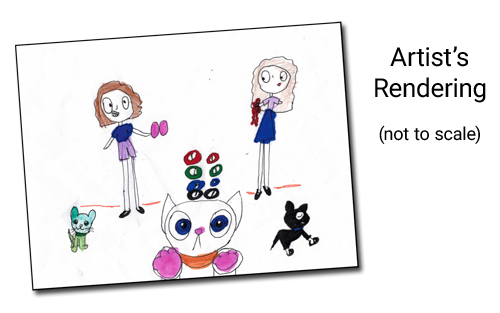 In January 2013, we appeared on the ABC show, Shark Tank and turned down a $400,000 offer from Kevin “Mr. Wonderful” O’Leary, who wanted 1/2 of the company. The show, though, was hugely impactful. First, the effort of preparing to appear on the show focused our commitment to the future of Xero Shoes, and it solidified our working relationship. Second, even though we were only selling our $20 DIY sandal-making kit, being in front of seven million people generated almost three month’s worth of revenue for us in the first week. Third, the Sharks had some, well, issues with us. Daymond said our product was just “rubber and string.” (Of course, Daymond made his money selling clothing that was just cotton and ink 😉 ). We took the Shark’s criticism and suggestions to heart and these helped guide our future product development. 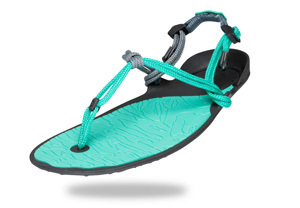 Finally, even though Xero Shoes started as a “barefoot running” product, we always believed our sandals were attractive to people outside that niche. The calls and emails we received after the show aired proved us right. Most of the new customers we heard from knew nothing about barefoot running and, in fact, weren’t even runners — they just hated having their feet wrapped up in tight shoes, or loved the idea of a super lightweight, durable sandal. Xero Shoes has over 1,000 four- and five-star reviews combined on our website and Amazon.com, as well as reviews in online and print publications. First, gratitude. 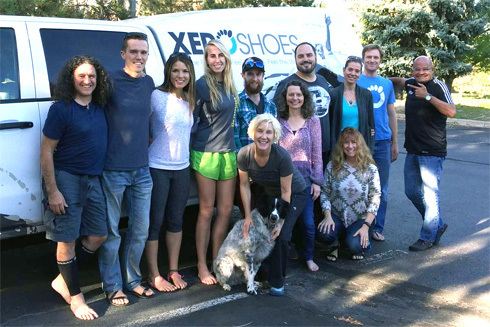 Xero Shoes has grown primarily through word-of-mouth. Our customers built our business. If you’re one of those customers, and helped us get to where we are now, we think you should have the opportunity to go with us into the future. Second is simply practical: A growing company needs capital. A rapidly growing company needs more.In both 2015 and 2016, we were not able to buy enough inventory to meet demand and ran out of many sizes, styles, and colors.Our projections for 2017 and beyond require larger inventory purchases. Third is what’s called “the democratization of capital.” Typically, companies in our stage of growth find a small number of wealthy investors and only that small group benefits from the future of the company.We think everyone should have the ability to support a company they believe in and, thanks to new crowdfunding rules, that’s now possible. Finally, we believe in the power of a community. We know that a group aligned around a goal can do more than any individual. Having a worldwide community that is invested – literally – in our future and our mission can have unimaginable power.We want to work with — and have fun with — this community to bring the benefits of natural movement to the world. Now, the company has 12 employees, including top footwear talent who’ve joined the the company because of their belief in the benefits of Natural Movement, their experience with our products, their commitment to the company’s mission, and their expectations about the company’s future. 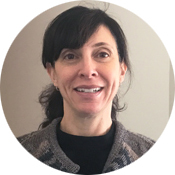 Lena oversees financial strategy, human resources and operations. A fourth-generation entrepreneur, she previously founded and sold a mortgage company, Preferred Capital, LLC. Since that sale, she has served as President of a management, internet marketing and publishing company, and managed operations for a housing cooperative. She is also an award-winning author. Lena attended Reed College and holds a BA from Naropa University. Dennis Driscoll, Chief Product Officer. 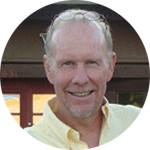 Dennis was previously the Global Design Director for Crocs, Inc., a billion dollar per year public footwear corporation, where he managed all of the new product designers. Dennis was one of four founders of Avia Athletic Footwear, which grew to $500 million in revenue and was acquired by Reebok. He has held senior positions at Converse, Wilson Sporting Goods, Doc Martens Footwear, and Osaga Athletic Footwear. Melissa Page, COO. 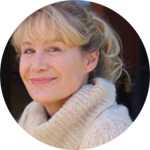 Melissa has more than twenty years of experience in big brand management. Most recently, she served as Director of Retail and Operations for the Henley Vaporiums in New York City. Her reach within Henley extended from product development and placement to store design and build out to retail marketing and staff management. Previously, Melissa has played a leadership role in helping to establish and grow the retail and wholesale businesses for J. Crew, Levi Strauss, Hawaiian Tropic and Wenger – Maker of the Genuine Swiss Army Knife. She holds a BA from Boston University. Here is, of course, the obvious part: Footwear is a big business. People wear shoes and sandals. We make shoes and sandals for people. The outdoor sports footwear dominates the sports footwear market and is anticipated to occupy more than 47% of the overall market share by 2020.5 These sports shoes are designed for fast and easy movement and facilitate hiking, walking, aerobics, gym and training, running, and outdoor activities. An increase in the participation rates in outdoor activities and high awareness of leading a healthy and active life will propel the market’s growth over the next four years. 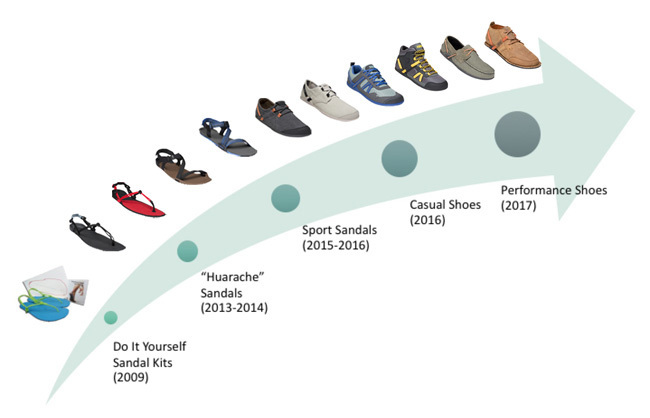 The athleisure footwear segment accounted for a market share of over 27% in the global sports footwear market in 2015 and is expected to maintain its dominant position in the market during the forecast period.6 Athleisure sports footwear includes footwear that can be used for both athletic and leisure purposes. The running shoes segment was the second largest segment in the market in 2015 with a market share of 21%.8 The increasing purchasing power of consumers in developing economies, and a growing consciousness about leading a healthy lifestyle and maintaining physical fitness are key factors that are driving people to take up running. Not surprisingly, we compete with any shoe company that offers footwear products for the activities in which Xero Shoes customers engage: walking, running, hiking, working out, yoga, paddle sports, etc. The athletic footwear industry is concentrated, with large brands that represent a significant portion of industry sales. Many brands are owned by large conglomerates that are active in other shoe types and a wide range of industries. The largest companies involved in athletic footwear include Nike, Inc., Skechers, Adidas AG, V.F. Corporation, E. Land World, Ltd., Puma SE, ASICS, Ltd. New Balance Athletic Shoe Company, Inc. and Wolverine Worldwide, Inc. Some of the companies listed above produce minimalist footwear. 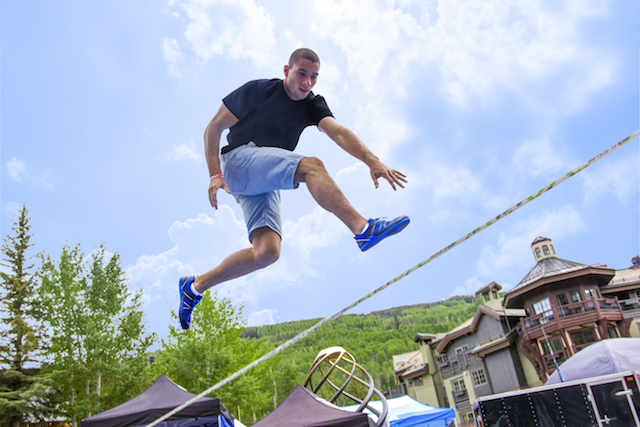 Examples of competitor’s products include the Nike® Free, Merrell® M-Connect and Barefoot, Vibram FiveFingers®, VIVOBAREFOOT (Terra Plana) and Luna Sandals. Since the inception of Xero Shoes®, a majority of sales have been generated by word of mouth and online advertising. We plan to further identify, activate, and support brand evangelists, influencers, and Ambassadors with both online campaigns and in-person events. Feel The World, Inc. has registered 14 trademarks and applications pending for 12 additional marks in the US and internationally. There is no guarantee that these additional marks will be registered. Successful registrations to date include Australia, Canada, Japan, South Korea, South Africa and Singapore. The Company has 113 registered domain names. The Company holds 2 design patents covering its tread design and Cloud sole. A utility patent has been allowed for our unique huarache-style lacing system. When you become a Xero Shoes investor, you get more than just shares in our company. At any investment level, you become part of a team that’s helping change the future of footwear. Investor-only access to sale events offering 50% off one pair of full price shoes per quarter (up to 4 pairs per year) until any of your shares are sold or transferred. Click here to hear if we start another investment round. https://invest.xeroshoes.com (the “Site”) is a website operated for Feel the World, Inc.
Feel The World, Inc. (“FTWI”) is offering securities through the use of an Offering Statement that has been qualified by the Securities and Exchange Commission under Tier II of Regulation A. This page is not a recommendation of or an offer to sell securities. Any securities offered are qualified in their entirety by and subject to the terms of the Offering Circular, which can be found at https://www.sec.gov/Archives/edgar/data/1690455/000106299317001033/offeringcircularx.htm or by clicking on the Offering Circular tab at the top of this page. This page and/or the Offering Documents may contain forward-looking statements and information relating to, among other things, the Company, its business plan and strategy, and its industry. These statements reflect management’s current views with respect to future events based on information currently available and are subject to risks and uncertainties that could cause the Company’s actual results to differ materially. Investors are cautioned not to place undue reliance on these forward-looking statements as they are meant for illustrative purposes and they do not represent guarantees of future results, levels of activity, performance, or achievements, none of which can be made. Moreover, no person or entity assumes responsibility for the accuracy and completeness of forward-looking statements, and the Company is under no duty to update any such statements to conform them to actual results. Investing in shares of Feel the World, Inc. involves significant risks and is suitable only for persons who can afford to lose their entire investment. Furthermore, investors must understand that such investment could be illiquid for an indefinite period of time. No public market currently exists for the shares of Feel the World, Inc, and if a public market develops following this offering, it may not continue. Securities are being sold only via definitive transaction documents contained in the full Offering Circular with Exhibits and any potential investor should read such documents carefully, including all of the risk factors relating to the investment, before investing. Those investors who cannot afford to lose their entire investment should not invest in this offering. All investors are strongly encouraged to make their own determination of whether or not to make any investment, based on their own independent evaluation and analysis or to consult your with your legal, tax and financial advisors before investing. The securities offered on this Site can only be marketed in jurisdictions where public solicitation of offerings are permitted; it is solely your responsibility to comply with the laws and regulations of your country of residence. 1As of February 28, 2017 according to unaudited company records. Please refer to Offering Circular at https://www.sec.gov/Archives/edgar/data/1690455/000106299317001033/offeringcircularx.htm for audited financial information. Past performance is not indicative of future results. 2This qualified offering is being conducted pursuant to Title IV Regulation A Tier 2 and is subject to the terms and limitations set forth in the Offering Circular found at https://www.sec.gov/Archives/edgar/data/1690455/000106299317001033/offeringcircularx.htm.